Earlier this week, RCCL told travel agents they would be adjusting their commission structure for 2009 for all their North American brands, Royal Caribbean International, Celebrity and Azamara. In the CND article we detailed the changes and the method, but the bottom line is that travel agents will either have to sell more to make the same commission level on each cruise they sell, or make less money on each one. While this may seem more of an agency issue, it will affect the consumer. Royal Caribbean doesn't allow their agents to rebate, so it won't affect the price you pay for your cruise directly, but it will probably shrink the incentives agents offer, such as free travel insurance or an onboard credit, or even the elimination (or reduction in quality) of a bon voyage gift. It will also affect things at more service-oriented agencies simply because the agency has to sell more cruises to make the same money, they will have less time available for each client. So far no other lines have followed RCCL's lead, but if they do, consumers will experience smaller rebates available on those lines thus increasing their bottom line price. Alaska Native Travel Guides will sail aboard 114 Holland America cruises this summer that include Glacier Bay in the itinerary. This will be in addition to the Tlingit cultural interpreters who board the ship at Glacier Bay and Hubbard Glacier to explain the origins of the Huna people, and the National Park Rangers who provide narration and presentations while in Glacier Bay and Hubbard Glacier. Complete details were in the May 30 edition of Cruise News Daily. Celebrity Cruises announced that Celebrity Solstice will enter service three weeks earlier than originally planned. The three new sailings will be on November 23 & 30 and December 7 and will all be the regular 7-night eastern Caribbean itinerary that it will operate all winter round trip from Ft. Lauderdale. Like Princess did earlier this spring when they announced Ruby Princess would enter service earlier, Celebrity is recognizing that there are people who booked the original inaugural date because they really wanted to be on the first sailing of a new ship. Celebrity, therefore, is following a similar plan to what Princess did. They have offered everyone booked on the original inaugural date of December 14 the opporutnity to rebook on the new inaugural date of November 23 (which happens to be a Thanksgiving sailing) in the same stateroom at the same price before sale opens to the general public. The other two sailings opened immediately. Holland America's Zuiderdam returned from drydock with some major updating, bringing the five-year-old Vista-class ship into line with the features offered on its newest Eurodam-class vessel. The updates include 34 new staterooms, an enlarged Pinnacle Grill and new Pinnacle Bar, expanded seating in the Lido Cafe, and upgrading the library to an Explorations Cafe. The work was completed during a three-week drydock at Fincantieri yard in Palermo. Complete details were in the May 29, 2008 edition of Cruise News Daily. NCL surprised five people with a free trip to Las Vegas that they hadn't been expecting. The people are registered on their special website that details new information about the line's F3-class ships as they release it. Visitors to the website have the option of registering or entering as a "guest." The people who were chosen at random will receive a trip for two to Las Vegas in June to be present when NCL executives reveal the next innovative features that will be offered aboard the giant ships which will be delivered beginning in early 2010. The complete story appeared in the May 29, 2008 edition of Cruise News Daily. Azamara Cruises announced today that Azamara Quest will return to Asia for the 2009-10 winter season. The program will include a series of 14- to 18-night cruises, all of which will have from two to six overnight port calls. The season will run from December through April, and the ship will be positioned via two 24-night cruises between Athens and Singapore. The sailings within Asia will embark at Hong Kong, Shanghai and Singapore. Details were in the full story which was published in the May 28, 2008, edition of Cruise News Daily. MSC Cruises is joining SATH, the Society for Accessible Travel & Hospitality. All MSC ships already have staterooms suitable for passengers with disabilities and wheelchairs, with bathrooms which are also customized to accommodate the needs of those in wheelchairs. All public rooms and elevators are also wheelchair accessible, and there are also accessible bathrooms on each deck. SATH membership will mean that future ships will be just as accessible and continue to improve facilities for passengers with disabilities. The complete story appeared in the May 28, 2008, edition of Cruise News Daily. 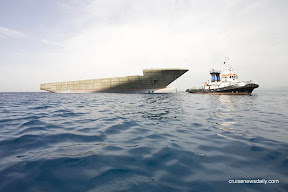 The hull of Seabourn Odyssey arrived at the T.Mariotti yard yesterday (May 27, 2008) new Genoa after being towed all the way around Italy from Venice. The ship is set to be delivered in June 2009. It was a busy holiday weekend for Norwegian Cruise Lines which will no doubt have NCL crew members filling out paperwork for days. 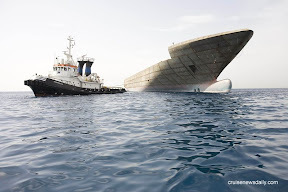 It began on Saturday (May 25, 2008) when Norwegian Majesty, on its way from Charleston (SC) to Bermuda, rescued four men from a disabled fishing boat during a storm. Sunday morning, Norwegian Spirit, while returning from a Caribbean cruise, came into contact with the pier in New York, causing relatively minor damage to the ship's bow and a pillar that supported the upper deck of a parking garage on the pier. Then Sunday evening, Norwegian Dawn, as it was leaving New York for Bermuda, called for Coast Guard assistance with a medivac for a woman who was experiencing chest pains. Details appeared in the May 27, 2008, edition of Cruise News Daily. 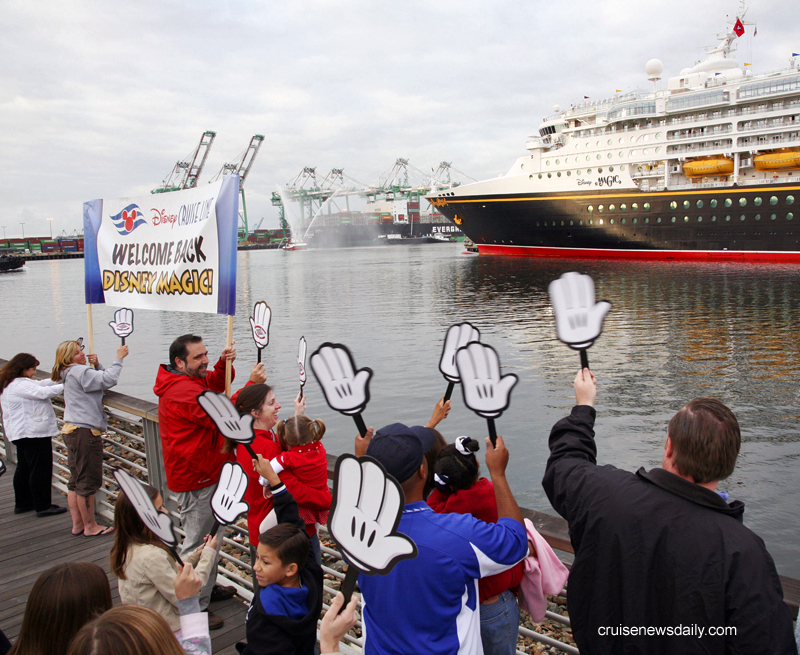 Disney Magic arrived at the Port of Los Angeles on May 25 (2008) for a three-month series of cruises from there to the Mexican Riviera. The series will run through August 10, and the ship will return to Port Canaveral via the Panama Canal cruise which will depart on August 17. The CND article covered the changes which have been made aboard Disney Magic since it last sailed on the West Coast in 2005 as well as the special programming aboard the ship for the Mexican Riviera cruises. The original story appeared in the May 27 edition of Cruise News Daily.